The sun is shining, the birds are singing and the kids? …are sitting in the dark watching TV. I switch it off and tell them to “go outside and play”. They mope, they whine, they complain. I stand firm and start bouncing a ball. Before I know it, the television is forgotten and they’re running and shouting with joy. It doesn’t take much to get your kids outside to play. Playing and being active is most children’s default setting. Get in the Habit of Playing Outside. We all do things by habit. If you’re in the habit of watching TV, it’s what you think of doing. 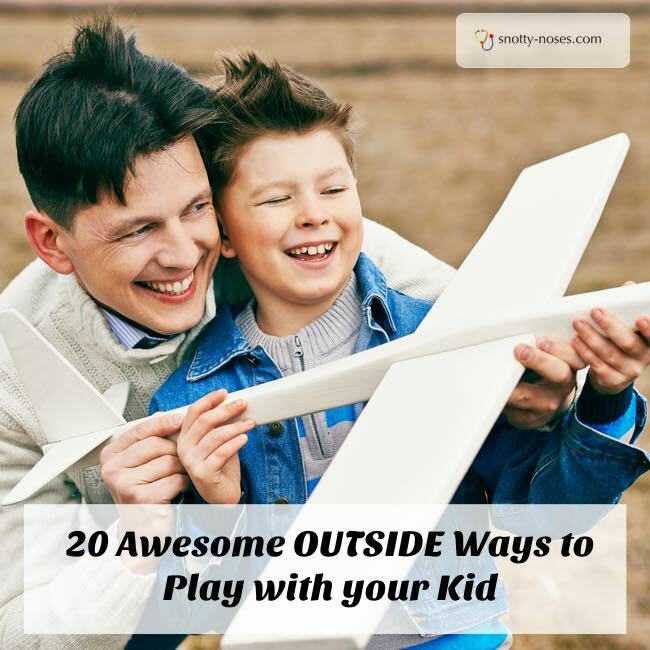 If your kids are in the habit of being outside, they will automatically go outside and play. All that running and jumping, ducking and diving. They see it as playing but it’s also great exercise. If you go and join in, it’ll be exercise for you too. Exercise doesn’t have to be going to the gym or swimming lots of lengths. It all adds up and half an hour playing outside is much better exercise than half an hour in front of the television. Once you start playing outside, you’ll soon be enjoying yourself. Enjoying yourself with your kids. You know what they call that? 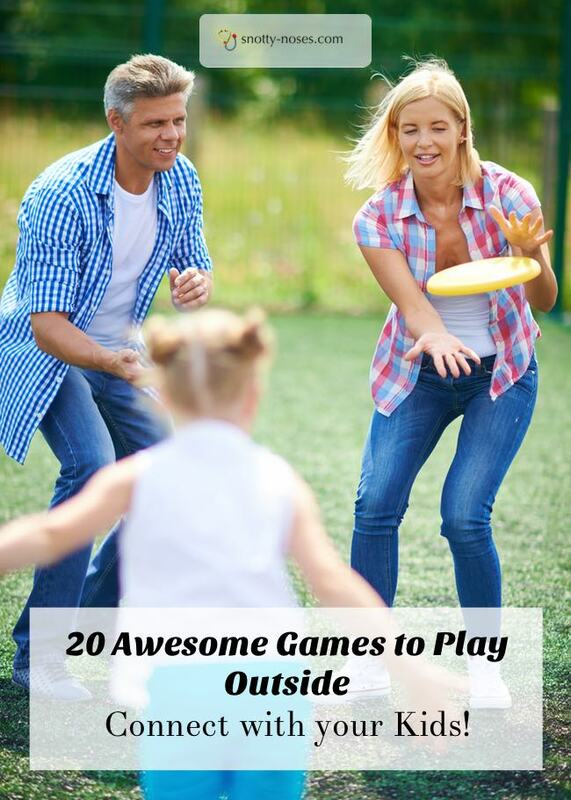 Here are our top fun games to play outside. You can play these games with all ages. You just need to think about the littlest ones but you’ll all have great fun. Catch. Simple, I know but it gets us started and is good for the toddlers to practise their ball skills. Piggy in the Middle. One or many people in the middle whilst the outside people try to stop them from getting the ball. Football. My kids love balls. We have many of them scattered around the garden. Our garden is not ball friendly. Too many spikes. We buy a lot of balls! Races. Quick and Easy. You can do simple races or make them more complicated. Tie their legs together or balance a small ball on a spoon. You may want to give the littlest ones a head start, or the older ones a handicap. Obstacle Courses. Equally, they can be easy or difficult and you can adapt them to your child’s age. Walk along lines, hop, walk backwards or sideways, under chairs, over tables and end it all by a nerf gun target. Use your imagination! The Dragon and the Hen. The kids line up behind each other with another person facing the line. The person facing them has to try to catch the last person in the line. The more people you have, the more difficult and fun it is. Human Knot. All hold hands, get tangled up. Try to undo yourself. Easier said than done! Hop Scotch. A child hood classic. If you can’t remember how to play, ask grandma. She’ll show you. Catch or Tag. Simple, classic that kids never tire of. Just playing outside with your toys. Gardening or making mud pies. Haha! I’ve done more than 20 as I keep thinking of them as I watch my children play. Playing outside is great fun. You don’t need to buy any of the games if you don’t want to. You can just keep it grass roots, simple childhood fun. So here’s my challenge to you. Choose one of the activities and go outside and do it. If your kids aren’t keen, just do it by yourself, they’ll soon join in. Who needs TV anyway right?